The Starboard Value hedge fund suggested exploring alternatives for Family Dollar stores, a board shake-up, and pricing changes. Shares of Dollar Tree Inc. (NASDAQ:DLTR), an operator of more than 15,100 stores across 48 states and five Canadian provinces under brands that include Dollar Tree, Family Dollar, and Dollar Tree Canada, were up 5% as of 3:46 p.m. EST after an activist hedge fund made a couple of major suggestions. Activist hedge fund Starboard Value LP, the ninth-largest Dollar Tree shareholder with a 1.7% stake, proposed that the discount chain sell its underperforming Family Dollar business and should replace a majority of the board of directors. Originally, Dollar Tree's acquisition of 8,000 Family Dollar stores was supposed to help battle competition from other rival discount stores as well as from Walmart, but same-store sales have flatlined over the past two years despite remodeling stores and increasing the product offerings. 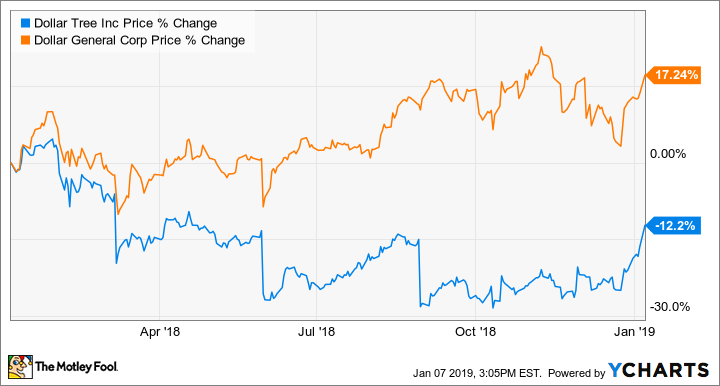 Dollar Tree's stock performance has also lagged behind competitor Dollar General over the past year. Dollar Tree's Board and management team welcome constructive input from shareholders about ways to further create value for all Dollar Tree shareholders. While we appreciate Starboard's investment and will evaluate any suggestions they may have as we would with any investor, we note that Starboard's nominations for a majority of the board were made without seeking any engagement or making any communication to the Company. There seems to be merit in Starboard's suggestion to sell Family Dollar, as the Dollar Tree branded stores drive the company's overall profitability and would be better valued on their own. Another Starboard suggestion was to raise some prices above $1, as trade tensions between the U.S. and China could negatively impact profitability. It's also possible that Dollar Tree's strict $1 price enforcement has caused products to be of lower quality than in past years, which has eroded consumers' perceived value and hampered business. Investors will have to wait to see how this all shakes out, but it's a positive development that a large shareholder is at least asking the right questions and making suggestions.